Before you install the Retrospect Virtual Management Console, please pay attention to the following system requirements and make sure that the requirements are met before getting started. The Retrospect Virtual Management Console should be deployed on a machine supporting 64-bit multiple CPU and multiple cores environment. A 64-bit operating system will allow Retrospect Virtual Management Console to run on a 64-bit Java JRE platform, as 64-bit Java is capable of supporting sufficient capacity for future business expansion, to meet the need of existing customers and to support new Retrospect Virtual Management Console server features. When you deploy the Retrospect Virtual Management Console, please consider to assign a dedicated disk for the system home and user homes. It is not suggested to install Retrospect Virtual Management Console on a disk which contains your operating system. Due to backup data growth this can quickly fill up the system drive which makes the operating system unstable, and may even crash the Retrospect Virtual Management Console. When you deploy a physical machine, please consider to purchase a more powerful machine. This will reduce the need for frequent hardware upgrades when your backup business grows, which will require services down time for hardware upgrades and data migration. It is a good idea to ensure your Retrospect Virtual Management Console is equipped with some redundancy features, i.e. power supply, and is connected to a UPS (Uninterruptible Power Supply). Connect a Direct-Attached Storage (DAS) with e.g. a 12 hard disk bays filled with 4TB hard disks via the SCSI interface, extra SCSI controller card required. With the above setup, it should be able to handle 100 users with around 30TB of storage and a total of 1000 backup sets. With this server setup, it is not yet reaching the server’s physical limitation. There are still other factors that may limit the growth of users, e.g. : network bandwidth. Also, it is easier to manage from administration point of view. Each user has round 300GB of backup data, with constant 3% of changes daily. Each user account has configured 10 backup sets. These backup sets could be run on different machines and backup to the Retrospect Virtual Management Console at the same time. Retrospect Virtual backup clients are enhanced to utilize multiple threads for backup and restore. It is recommended to keep the maximum number of concurrent backup jobs on the Retrospect Virtual Management Console to 1000, to avoid potential performance problems. Additional Storage on Cloud: Besides local storage, you can set up network storage, FTP/SFTP and common cloud storages (Google Drive, Dropbox, OneDrive, Amazon Drive, Box, etc.) for the Retrospect Virtual Management Console. It is more flexible when you deploy Retrospect Virtual Management Console on virtual machine environment, as you can increase memory size, process cores according to the actual need. If VM snapshots are not required, please try to delete or reduce the amount of snapshots stored on your disk. Please also check on the storage requirement on virtual environment. Additional Storage on Cloud: Besides local storage on your virtual machine, you can set up network storage, FTP/SFTP and common cloud storages (Google Drive, Dropbox, OneDrive, Amazon Drive, Box, etc.) for the Retrospect Virtual Management Console. To host an Retrospect Virtual Management Console on cloud, the basic requirement would be similar with setting up a physical machine. It is more flexible when you need to increase memory size, process cores, and disk space. In addition, you will need to take the running cost of a server instance and network usage, which are considered as a hidden cost for the setup. You can consider hosting a cloud server instance such as Amazon or Azure. If you are deploying the storage locally, you are required to set up storage with redundancy, such as RAID 5 or RAID 6. This is important especially when you are delivering a backup service with good disk performance as well as good fault tolerance. As the cost of hard disk has reduced a lot nowadays, it is strongly recommended that you format your disk volume with RAID 6 that maximizes the protection. When you partition the disk in your new server, please consider to set up dedicated virtual disk volumes for operating system, application system and user homes, respectively. It is a common practice that application system home and user homes are not located in the system volume, which may fill up easily, causing the system unstable. If you plan to have physical backup server, you are expected to have a fast local backup storage such as local hard disks, DAS or SAN. It is a solution for your business which wants to host the backup data with your physical backup server in your server room or data center. Please avoid using network storage such as NAS, share drive on another computer as the backup and restore performance is lower. If your backup server and user’s data are hosted on a virtual environment, you need to check on the following to make sure the performance has been optimized. When you set up a disk to attach on a virtual machine, please consider choosing the “thick provisioning” option or the “allocate all disk space” option. This is because choosing “thin provision” or non “allocate all disk space” option may slow down disk performance when the amount of data grows. Please also consider running the user home on a dedicated virtual disk, which is configured on fast and non-busy physical disks. If you are considering hosting your backup server instance with a commercial cloud services provider such as Google, Amazon, Azure etc., you need to set up cloud storage for your user home, predefined destination as well. Internet connection: You need to have Internet connection to access the Retrospect Virtual Management Console user web console. Web browsers: The Retrospect Virtual Management Console user web console runs with all major browsers such as Google Chrome, Microsoft Internet Explorer, Mozilla Firefox, and Apple Safari. Please make sure that you are using the latest version of the browser. In this section, we shall discuss the network and firewall settings required for the Retrospect Virtual Management Console. These include the access to the web interface, license activation, backup and restore processes, email port settings. The use of dynamic IP addresses for Retrospect Virtual Management Console domain names may result in an unstable backup service,. A static IP address will ensure the remote IP address sent by Retrospect Virtual Management Console to the license server will remain the same during daily routine license checks. This will avoid potential license errors, i.e. 1011 or 1012 license errors which could result in the automatic shutdown of your Retrospect Virtual Management Console service. It is strongly recommended that you use a static IP address for your Retrospect Virtual Management Console server to ensure a stable and reliable backup service. 80: HTTP port for incoming backup and restore traffic, browsing the Retrospect Virtual Management Console web interface. 443: HTTPS port for incoming backup and restore traffic, browsing the Retrospect Virtual Management Console web interface. 25: Outgoing SMTP port to the SMTP server. It is recommended to expose only TCP ports 80 and 443 to the public on your firewall. Please consult the user’s manual of your firewall for more information on how to do so. For security reasons, we would recommend that the Administration Panel of Retrospect Virtual Management Console must be hidden from public access, i.e. it should be exposed to local area network only, or you may restrict a range of IP addresses to access your Retrospect Virtual Management Console console. The Retrospect Virtual Management Console server is required to access the Internet in order to activate the trial license key or validate a purchase key. Please ensure the firewall outbound connection settings are enabled and the TLSv1 setting is allowed. Log in as Administrator on your Windows machine. In a browser, download the Retrospect Virtual Management Console installation package. Choose the language, and then click OK to continue. Select I accept the agreement after reading the license agreement. Then, click Next to continue. Choose the installation directory. Then, click Next to continue. Enter the ports to be used by Retrospect Virtual Management Console. By default, the ports are 80 and 443 (HTTP and HTTPS respectively). If these ports have been used by other applications, e.g. Microsoft IIS, Apache or other applications, please use alternative ports such as 8080 and 8443. Click Next to continue when you are done setting. When you need to reset the service of an item, select the item (e.g. Retrospect Virtual Management Console) and then press Restart in the left pane. Alternatively, after selecting the item, press Stop and then press Start. Open Command Prompt and type the following command to check whether Retrospect Virtual Management Console is listening to pre-defined http and https ports. The default port values are 80 and 443 respectively. You get a list of all active connections. You can see clearly that Retrospect Virtual Management Console is listening to both ports 80 and 443. Configure the SMTP so that you can receive reports from the Retrospect Virtual Management Console. Click the orange Basic icon under System Settings section on Retrospect Virtual Management Console main page. In the Email tab, locate the SMTP Server section. Then, click the + button. Enter the SMTP mail server settings in the Host Name and Port fields. If authentication is required, check the checkbox next to Require SMTP Authentication and then enter the Login Name and Password. Optional: Check the checkbox Use secure protocol if required. Select the type of Protocol from the drop-down box. Enter the report sender’s name and email address. Click the tick icon at the bottom right corner to save the SMTP settings. Click the Save icon at the bottom right corner to save the settings. Note: If you don’t have a SMTP server, you can consider using a free SMTP such as Gmail. Configure the Retrospect Virtual Management Console hostname and system home path. Host: This is the host name of your Retrospect Virtual Management Console. You can enter the domain name of your Retrospect Virtual Management Console in the formats IP Address:port_number or http://www.mybackup.com:port_number. 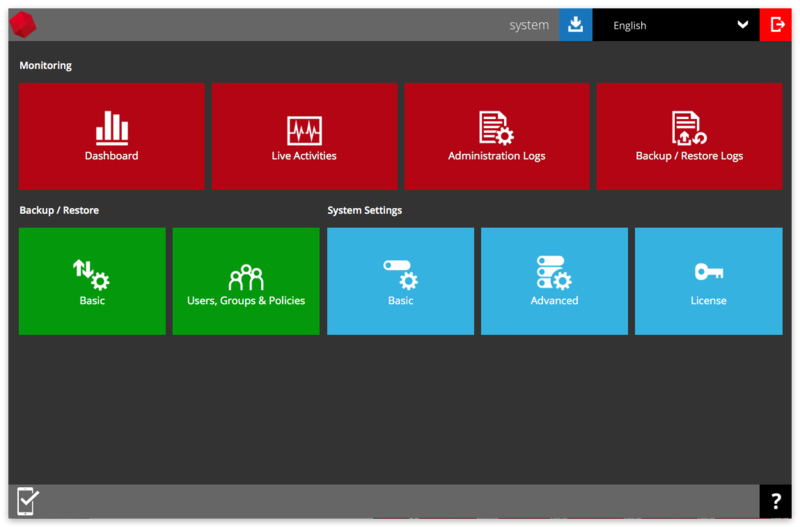 System Home: This is the system home location of your Retrospect Virtual Management Console where the system logs and group policy files are located. This path is set to your installation home by default. For production systems the system home should not be setup on the O/S partition, as the logs could fill up the drive and result in system instability. By default, the Upload Encryption Key option is enabled. However, it is not recommended and will be disabled in a future release. In a browser, download the backup clients by clicking the blue Download icon at the top right corner on the Retrospect Virtual Management Console main page. Go to Start Menu > Programs > Retrospect Virtual Management Console > Uninstall. The Retrospect Virtual Management Console Uninstall wizard will be shown on the screen. Click Yes to start uninstalling Retrospect Virtual Management Console. Once the uninstallation is completed, the system would show the following dialog box. Please click OK to close it. After successful uninstallation, Retrospect Virtual Management Console and NFS service will no longer be available because removal of the startup scripts will stop the services from starting at bootup. The system would automatically open a window to the installation path, so that the USER_HOME, SYSTEM_HOME and POLICY_HOME can be copied/backed up if required.